G. P. Putnam’s Sons; hardcover, 1933. 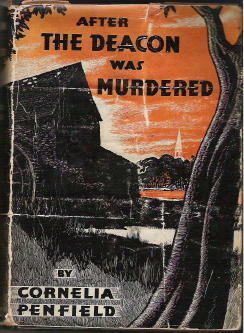 After the Deacon Was Murdered is the first of two mysteries written by this little known Connecticut author, and as such, is it (you may be wondering) forgotten gem? An honest answer has to be, “Almost, but not quite.” Forgotten, it is true, but while it has some weaknesses (and one near-fatal one), there are some very good moments to be found as well, simply by plunging right in. Finding the murder victim, Jarius Hanford, in the small town of Deptford Center (near New Haven) is Geoffrey Hamilton, who is not vacationing there, but rather recovering from a nervous breakdown suffered the previous fall. The investigation expands beyond the townspeople and the village folk, however. There is a gang of organized criminals working in the area – one of them is Big Slim Blivinsky – plus a fugitive from a mental institution, and a misguided newspaper reporter named Parsons who gets Hamilton even more involved than he’d intended. There is also a map, and it’s important to the solution of the case, as well as a good timetable and the establishment of alibis – or not. All in all, there’s an abundance of good stuff, but there’s a key aspect thats missing, and that’s a strange unreasonable lack of curiosity at the proper time. Curious things happen, and no one – including (or maybe especially) Hamilton – asks the overtly obvious question, what’s going on? One case in point – and I hope I’ve made this interesting enough that you’re still with me – on page 78 Hamilton is going to bed after an exhausting day, and he finds fresh blood on his shoe. “It was stained and wet – wet with clotted blood, still fresh enough to show color on his finger.” And ... he gets under the sheets and goes to sleep. The middle, then, is somewhat of a muddle, as you undoubtedly have gathered. It’s worth persevering, though, since the ending shows flashes of brilliance – and I have the strongest feeling that if you were to start over, from beginning to end, the whole accumulation of small hidden mysteries would all fit into place and make perfect sense after all. But the solution was agreeable enough, and the characters engaging enough, that after thinking about for a while, I finally decided discretion might be the wisest thing to hang on to here, and that the proverbial bird in the hand is not worth looking out for trouble when you needn’t. In other words, trying to be as clear as I can, if you can forgive the spots where the going is the weakest, you may find yourself enjoying this as much as I did. Maybe it’s because the whole affair takes place locally, a mere 70 years ago, and that always helps. But if you read only private eye and noirish pulp fiction, the chances are 80-20 that you should not even begin to take me up on this as a recommendation, no matter how well-meaning I intend it to be. Two mysteries published in one year, and then nothing more. And the unknown story behind this fact looms nearly as large as the one that’s presented in this, the second of the author's efforts in the realm of detective fiction. Two other minor characters have equally minor (but nonetheless significant) roles in this one as well, Judge Whitaker and the unsavory reporter named Parsons. But with the lack of any other detective by designation in this one, Miss Trimble seems to share the role as sleuth with her co-worker on the dead man’s proposed biography, a young college graduate and presently out-of-work advertising copywriter, Anne Exeter. It is Mrs. Prelton’s idea for the biography, coming five years after her husband’s mysterious death, but who has put her up to it, no one knows. Everyone who was at the gathering at Skyetower that evening then has been invited back, and no one dares refuse the widow’s change of heart – she had closed the mansion and had all but never mentioned her husband’s name again. The backgrounds of all of the guests – many of whom have fallen on hard times in the meantime – are interwoven and tangled together in intricate fashion, and much of the delightful first half of the book is spent in unravelling the various threads of their lives. It is a Christie novel that the author is attempting, but with a homespun and not-so-prim New England sense of humor mixed abundantly in. A stuffed dog with a collar studded with diamonds also figures prominently in the early going – it seems to have been the basis for a smuggling scheme that the some of the people in the widow’s life (including a European prince from some small outpost overseas) have been involved in. The prince smiled with puzzled politeness and turned again to speak with Mrs. Prelton. The dead man, as it not very surprisingly turns out to be the case, did not have many friends, no matter how many guests were on hand during the fateful evening, and one gets one’s hopes up that this will really be a jewel of a mystery, or at least I did. But the ending is disappointing, wrapped up in much too quick fashion, with yards and yards of explanation to go with it, and yet not enough to explain why Jane’s drive over the mountain to look up some records on page 276 was exactly the right place for her to go, and at the right time, to get to the bottom of the mystery. Then again, a genealogist has to go where the records are, and if coincidentally it all connects with the matter of Mr. Prelton’s fatal fall from a window, then why not accept good fortune when it comes along? PostScript. Cornelia Penfield Lathrop was born in 1892 and died in 1938, five years after the two detective novels she wrote came out. From google.com I discovered that she was the producer of a Broadway play in 1923, and that she was very much someone who was interested in local Connecticut history, if not genealogy herself. In 1930, for example, she was the author of work of non-fiction entitled Black Rock, the Seaport of Old Fairfield, Connecticut, 1644-1870. No copies are available on abebooks.com, but most every library of a certain size in the state seems to have a copy. But what’s most intriguing is the statement that appears opposite the title page of this second mystery, to the effect that In Preparation was her third, After What the Doctor Said. If your brain doesn’t start tingling like mine did, then maybe you’re reading the wrong magazine. You have to wonder how far along the unpublished manuscript got, why it never got finished, or if finished, then why it was never published. Your assignment for Monday, then, if you accept it, is to investigate, find out more, and report back with everything you learn. Typed manuscript with corrections made by hand. No date. Unpublished. What I didn’t expect, whenever it was that the question was asked, or at least not realistically, was the reply that manuscript still existed, and would I be interested in seeing it sometime? I think my mind went blank right about then, but you know what my reply had to have been. I went to see it, had a chance to have another lengthy conversation with Marilyn Lathrop and (which I never really anticipated) I was allowed to borrow it. I have kept it far too long. There were some extenuating circumstances, including a number of unexpected events that intervened and kept me from starting to read it, but I think the real reason I put off reading it for so long was that for me, it was a once-in-a-lifetime event, and I was simply relishing the anticipation much longer than I should have. As to the answer to the question as to why the book was rejected – and this is the family’s version of what happened – is that the publisher said it “wasn’t seamy enough.” When we get to the review proper, I’ll go into that, but later on Marilyn partially reconsidered, saying that perhaps “seamy” wasn’t the word that was used, but even if it wasn’t, it was close. What I didn’t realize right away, though, is that the title of the manuscript I have is NOT the title of the third book that was promised, and there is nothing in the story itself to suggest the title was changed, there being no doctor in the tale that I have. So there is a fourth novel, and it is still missing, and unless someone in the Lathrop family remembers something – a box or trunk never opened – we shall reluctantly have to assume that it no longer exists. It also seems possible that After the Town Clerk Died is a novel that was never sent to Putnam’s. It may have been that After What the Doctor Said was the one that was rejected, with the aforesaid comment attached, and that Town Clerk was abandoned before completion, almost but never quite finished. It is, I am sure, no longer possible to say. It is remarkable that the typed pages still exist. As a mystery, it needs some work. I’ve never tried to write a full-fledged detective novel, or even an unfledged one. Reading this, in what I’m going to continue to think of as being in the form of a rough first or second draft, gave me quite a bit of insight into the physical problems of doing so. Being sure that an event mentioned on page 233 (say) as having happened earlier on page 165, really occurred, for example, and that a clue discussed on page 198 (say) was mentioned and pointed out back on page 53. Jane Trimble, the semi-elderly genealogist who appeared in the two published books, also appears in this one, her primary focus being that of keeping her friend Gordon Burr from becoming a suspect in the death of a man in a suspicious fire. Burr is a writer who is not only having problems completing his latest book, but who is also having domestic troubles with his wife, and Jane cherishes them both. I don’t imagine retelling the plot in detail makes a lot of sense, as when is anyone else ever going to be able to read this as a work of detective fiction? I’ll retract a good deal of what I was going to say, and start painting things with a wider brush. But what I started to say still applies. Jane was hardly the detective of record in the first book at all, and it was something of a surprise to find that she appeared in the second. In the second one, Widow, she shared sleuthing duty with another character, but in this one, she is the primary detective, even to the extent that she is the one with a watchful eye out for trouble even before there is trouble to be had. And here lies a problem. It takes nearly 150 pages before the body of the dead man is discovered, and it takes a fairly talented mystery writer to keep the reader’s interest that long, with little or no “action” taking place. There are a lot of characters to identify, a lot of refined conversation to listen in on – this is suburban Connecticut, after all, and even in (say) 1935, the level or refinement was greater than many another part of the world. Once Jane’s detective activities begin in earnest, it is quite a complicated state of affairs the mystery finds itself in, and – here’s another problem – many of the clues happened or were discovered back in the earlier portion of the book when no one (but Jane) even suspected that they were clues. An alert reader might get glimpses of the essentials of the plot in its early going, but as the manuscript now stands, some strong rewriting seems to be very much necessary. There is a great to-do about who was where and saw what when, and even more about beards, false beards, who had one and who shaved one off and who hired someone to impersonate them who did or did not have a beard when he needed one. I may not have implied what I wanted to in that sentence. It is all very fascinating. Postscript: I debated for a while whether I should do this, and once again, since you’re reading this, you will know that the better argument won. Here’s a longish quote from pages 245-246, getting within a hundred pages from the end. It will give you a sense, I think, of Cornelia Penfield’s knowledge of the conventions of the mystery field, and how, as I’ve mentioned in the two previous reviews, how she liked to play around with them. Reviewing her evening with the Admiring Confidants, in the foggy dawn of a New York spring day, Jane felt she had not shone. How was it that fictional detectives made themselves the center of awestricken attention, summed up their findings in crisp dramatic sentences, and stated so authoritatively that the criminal must have done this and that as was clearly shown by these and those? By what magic did they also find various district attorneys, solicitors, barristers, photographers, experts in criminology and laboratory practice, reporters, butlers and valets to abet and assist the Super-Detective without wanting any reward beyond a kindly smile, who argued with him just sufficiently to point out his infallibility- and were content with being yes-men and filling about two hundred and ninety pages of escape literature? None of her own intense concentration and really intelligent work on the Dymchurch affair had to date earned her a darned thing- and might possibly, as Judge Whitaker had hinted, be bringing her activities suspiciously into the official limelight. However positive she might be that at least one of the theories so neatly worked out and counter-indexed in her notebook was a correct solution, just how was she going to submit the notebook to the Principal Official and secure his kind attention? After having, for reasons which at the time appeared to her sound, led him to believe her a romantic and muddleheaded moron? And coming down to her own friends from whom at least she had the right to expect some awed silent admiration, what had been their attitude? Merely a polite and passing interest in the least important phases of the whole affair – the beard and the altered entry – and in order to explain those she had had to battle against guppies and banal bunnies as conversational topics! Worse of all, Judge Whitaker upon whom she had relied for so much of encouragement and intelligent cooperation, had not only failed her utterly, but had expressed his opinion in tactful judicial terms that she was a Meddlesome Mattie, and had better let the state of Connecticut and the town of Dymchurch deal with their own affairs as they were so well equipped and prepared to do. She sipped her coffee and enjoyed one of the famous St. Crispin croissants and decided to live a while longer, Langton willing. Even though a few more deaths were needed to bring the Dymchurch quota up to a good Van Dine average. “Are you representing him or Julia in the oncoming action? Or doesn’t one ask?” Phyllis nibbled a cracker. He began to outline amusingly a case involving a farmer and his step-son. Phyllis listened with applauding phrases at the right moment. Jane divided her attention between the table in the alcover – as yet unclaimed – and his bland face and pleasant voice. She had rather a prejudice against young lawyers, so given as a rule to screening their uncertainies by bumptious pronouncements and bristling authority. Wyckoff was of another sort. He had an adaptable geniality that hinted of the politician – of experience in gaining the confidence of folk of all degrees. A tactful young man, she concluded, who had been about a bit, who was sure of himself but not irritatingly so, and who might will be exactly what her beloved old neighbor, Judge Whitaker had been in his green legal youth. The anecdote finished, he again referred to Jane’s detective experience. In conclusion: Thanks again to Marilyn Lathrop for allowing me the use of the manuscript, and for the conversations we have had concerning her husband’s mother. Since Marilyn never knew her mother-in-law, her own knowledge is based on what Robert and other members of the family have told her over the years. Cornelia’s daughter Helen Harriet Petty is still living. She is in her late 80s, and the memories she has of her mother have been conveyed to me through Marilyn. A nephew, Fred Lathrop, is also still alive, and he has assisted me in proofreading the reviews and commentary above. He remembers her only as a young boy, recalling for the most part the years toward her death, when she was often bedridden with tuberculosis. My impression of Cornelia Lathrop, through these conversations, was that she was a very progressive woman, ahead of her time in many ways. Similar in nature, I believe, to Eleanor Roosevelt, a lady whom Cornelia is said to have met. Not many women in the 1920s, for example, would take her three children to live in France for well over a year without her husband, who stayed home working. She was always interested in the arts. Besides her brief involvement with Broadway, previously mentioned, in the mid-30s she also wrote several articles for Stage Magazine, including five in a 1936 series on famous Hollywood directors. 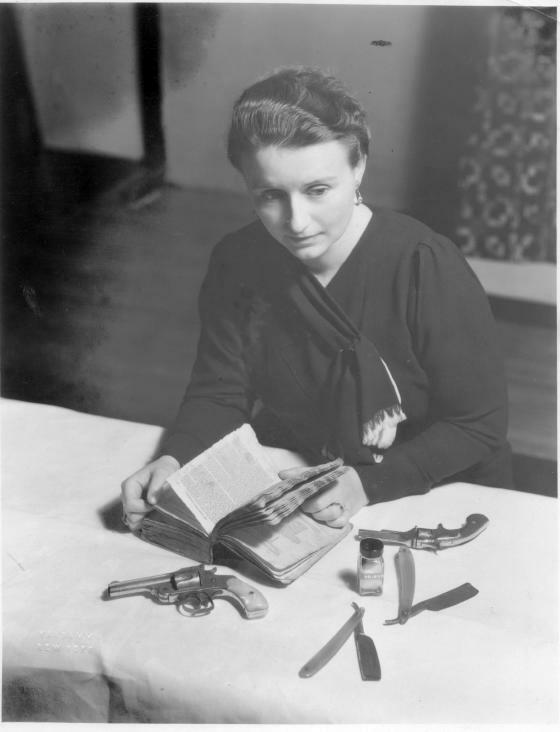 The photo you see is a publicity shot taken by her mystery publisher, G. P. Putnam. It’s nice to be able to display it again. Thanks to Amanda French of Gyre & Gimble Books, Holden ME dogbert.abebooks.com/gyre&gimble for the photos of the cover and inside jacket blurb for After the Deacon Was Murdered. Carroll & Graf, paperback reprint; 1st pr., November 1985. Hardcover editions: Hodder & Stoughton (UK), 1958; Doubleday (Crime Club), June 1958. Hardcover reprint: Mystery Guild [book club], July 1958. Contained in Five Spy Novels, Howard Haycraft, ed., Doubleday, Oct 1962. Other paperback edition: Ace D-389, no date stated . 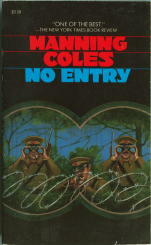 I imagine that if you know anything about Manning Coles the author, you may already know that there never was a Manning Coles. The semi-jovial spy thrillers that appeared under his name were actually written by two friends and neighbors in England, Cyril Henry Coles (1899-1965) and Adelaide Frances Oke Manning (1891-1959), all but a few of them starring the steadfast British agent, Tommy Hambledon. Search for a Sultan [by Cyril Henry Coles & Tom Hammerton]. Hodder, 1961, hc; Doubleday, 1961. The House at Pluck’s Gutter [by Cyril Henry Coles & Tom Hammerton]. Hodder, 1963, hc; Pyramid, 1968. Question: Was the previous book [Crime in Concrete (Hodder, 1960, hc). U.S. title: Concrete Crime. 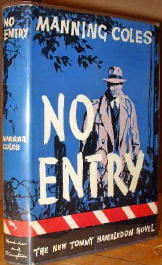 Doubleday, 1960] written by C. H. Coles alone or with another collaborator? No matter how it works out, this places No Entry as either the last or next-to-last in Manning’s tenure, and unfortunately it’s not one of the better one in the series. If you don’t start with the first two, Drink to Yesterday (Doubleday, 1940) and A Toast to Tomorrow (Doubleday, 1941), preferably in that order, then any of the other immediate post-war books will do. 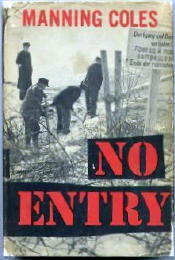 In No Entry, however, decidedly a Cold War novel, the two authors seem to have run out of steam. It’s not entirely a book not worth your time, but the minute the young naive son of a British diplomat unwittingly crosses the border from West Germany to East, and Hambledon arrives to see what he can do about the situation, you know that he’s going to find a way across the nearly impenetrable border, and make his way back out again. When Hambledon finally does cross the border, it is in a old automobile constructed of various makes and models, and he adds some gunk to the engine to make it misfire uncontrollably, belching black smoke and threatening almost to explode if one were to look at in a threatening manner. Which is a huge amount of fun to read until you (the reader) realize that there really is no point to such a matter of calling so much attention to oneself, if you are in enemy territory under false pretenses and with high hopes of retreating back across the border with another person with you. Does such behavior make you less suspicious? Does it draw attention away from you and more toward the automobile? What sort of agent would behave in such a fashion, he must not be an agent, perhaps? I’m the one supplying the possibilities. Coles does not. The uproar goes on, stops, and with or without it, the story seems to continue as it would have, either way. Coles seems to be very familiar with the area in which the story takes place, which adds immensely to the pleasure provided by say, the first two-thirds of the book. The final third is where the letdown occurs, and even so, it doesn’t make this a bad book, only one that’s disappointing in a way that suggests that it might have been better. And that’s it. 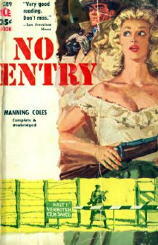 I haven’t tried to look elsewhere, online or in any of the other Manning Coles books I have. I’ll allow you to tell me more, if you can? Copyright © 2005 by Steve Lewis. All rights reserved to contributors. Return to the Main Page.